HDD Disk 2.0Tb external USB 3.0 Toshiba. Formatted by WIN 10. 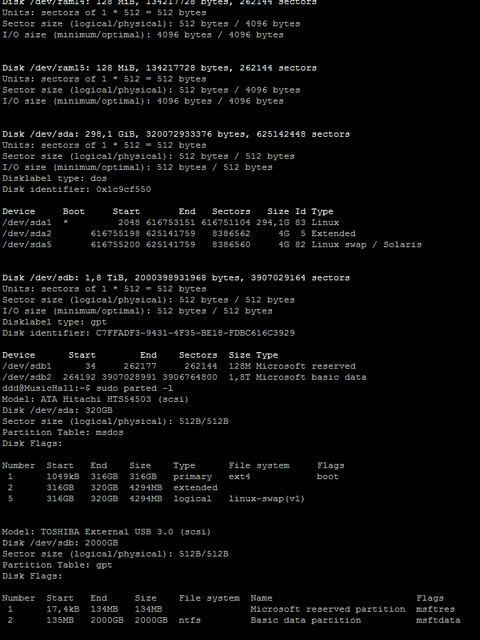 GPT partition table. (07-Jul-2017, 07:24 PM) Integra Wrote: HDD Disk 2.0Tb external USB 3.0 Toshiba. I wonder why. I'd have to set this up and then run some tests on my side and get back to you tomorrow. Do you have any NTFS drives that mount OK, or is it just this specific disk? Can you SSH into the machine, and run this? Cut and paste both the outputs so I can see what they are like. I'm guessing fdisk may not work well with GPT partitions. Snakeoil Operating System - Music, your way! Nice find on that bug. My auto-detect code has a bug. Use /dev/sdb2 in the media field and save the configuration. That in theory should work. Let me know if that works and if yes, I'd fix this in the next RC release. Ok fine. /dev/sdb2 is working! (07-Jul-2017, 08:52 PM) Integra Wrote: Ok fine. /dev/sdb2 is working! That's great to hear. I'd get this fixed for the next RC . Our mission is to create a free to use computer OS that is easy to install, intuitive to operate and play music that will connect and engage with you emotionally. SnakeoilOS gives you the freedom to spend more time on listening, enjoying and exploring music. Wasting time on computers is now a thing of the past! Everything is constantly evolving/improving. Please check back often for updates. If you like this project, do show your support with a small token donation. All donations collected will be used to run this website, and for purchasing new equipment for the project. How to mount Exfat formatted USB drive?